others. Currently there are several high quality photo studios in the area. And for good reason. This place is extremely photogenic and close to other scenic areas. It is a perfect place to live if you are a photographer or other artist or writer. In Carmel, there are literally 100 fine art galleries in a 4x8 block area! I returned for to Point Lobos for another image of this impressive rock. This version is just before the sun dropped out of the clouds. 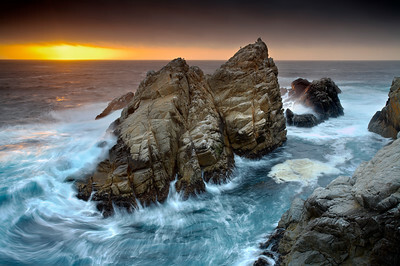 Point Lobos, at the north end of Big Sur just south of Carmel, California could keep a photographer busy for months or even years. 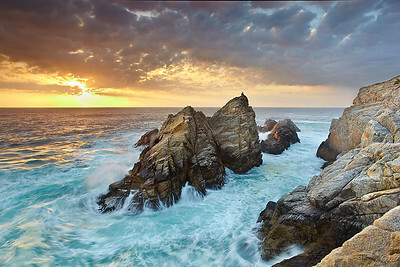 It is a peninsula that has been sculptured by large Pacific waves over millions of years and the results are stunning. This is one of the western-most points of rock and is probably 50 feet tall at high tide. Sometimes waves wash over the entire rock. This is a wde view with more light striking the cliff face and sea. I've been planning this shot for about two years. I noticed the layered slabs of rock and how they seemed to point to Bird Rock in the distance, but the conditions were never good for the element of atmosphere. Finally the storm came through and I was able to make the image I had hoped for. I waited for a bit of light to strike the rock and hillside to the left. Then I waited for a wave to sweep into the cove. There were big waves striking the rock in the left-center, but they were big and blocked the rest of the scene. So I waited for calmer conditions. As the moon set over the ocean, the sun was rising behind me. When the light between the moon and sun was even, I waited for a large set of waves to break in this 0.8-second exposure. It was a beautiful morning! As the sun rose into a hole in the clouds to the east of Carmel State Beach, I turned and saw a band of rain illiminated by the first light of the day. As the sun grew stronger, a rainbow formed and it lasted about 20 full minutes. 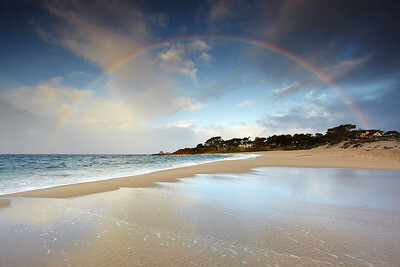 The shape of the mountians often creates a hole to the east of Carmel and these rainbows can form fairly often! 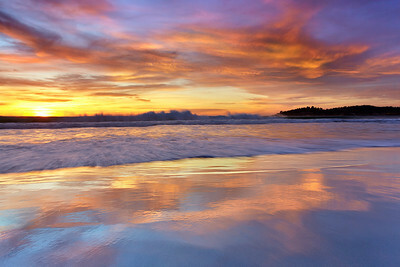 A winter storm had battered the coast for much of the day, but as the sun began to set, the sky opened up just in time. 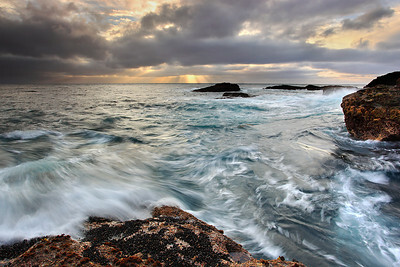 I got as close to the water as possible in order to capture the chaotic swirling movement. It was a bit nervewracking being this close with slippery rocks providing the only exit from this rocky outcrop. I kept an eye on the big waves and waited for a smaller one to sweep by. I had to run several times before I finally captured this scene. As the sun set, the rays of the sun burst forth and the light spread across the water. The light on the water is actually being reflected from a very bright bit of sky just above the top of the frame. I made sure to exclude the bright area from this picture because it would have been too bright to expose correctly. 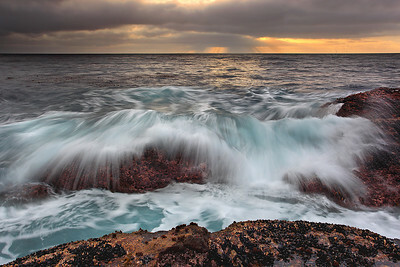 I got close to the action and after a bit of dodging the water, I was able to capture the way the waves struck the rock. I always keep an eye on the waves just in case. A 1/4-second exposure is usually long enough to show some motion without the water looking frozen, nor like a cottony mess! 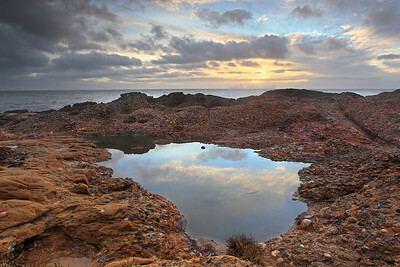 As I was running to my next planned spot, I came across this tidepool. There was an image I had in mind and the light was fading, but I could not resist the calm conditions and perfect reflections. So after a bit of moving back and forth looking for the best composition and a cloud to move into the pool, I made the image. I have always liked the way the water moves through these rocks, so I waited for the atmosphere to be right before making this photograph. Sometime I will wait for a year or more before conditions are right. Finally, the fog lifted just enough to let in some color at first light at Lover's Point near Monterey and Pacific Grove. The low angle of light also shows the color and texture of the rock at its best. 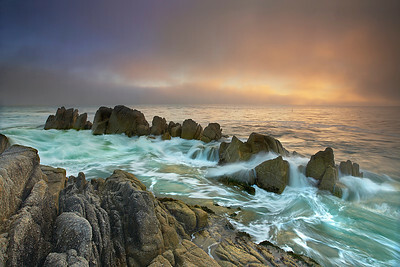 I liked the contrast of the sharp lines of surging water against the softness of the glowing fog. I had to study the ebb and flow for quite some time in order to figure out how best to time the waves. Rarely did all this action happen all at once. 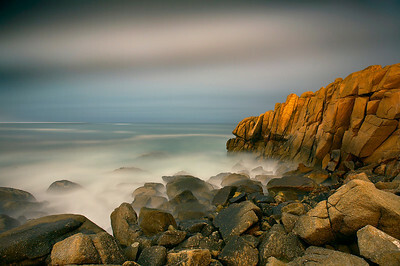 The clouds opened up and let the moonlight through to the rocks and sea on a foggy Monterey night. 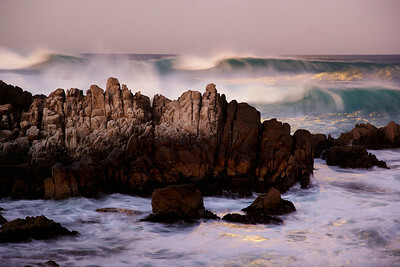 The violent surf was smoothed out by a long exposure, making this place look like another world. Fog at night creates a lot of atmosphere even though the stars are not visible. Because the fog came and went and I was making long exposures, some images were underexposed while others were overexposed. It really is a matter of luck in situations like this, so I spent a few hours making just a few images, of which only this one turned out well. Time well spent I believe!. The first light of the day can often be the best, even in an area known for its sunsets. I had to get wet to get close enough to the surf to capture every fine detail in the ocean, yet still allow the Santa Cruz mountains to be seen 40 miles away in the distance. There were many chaotic motions happening at once, so it took a while before I could capture lots of motion going in the same direction. It was a memorable morning. 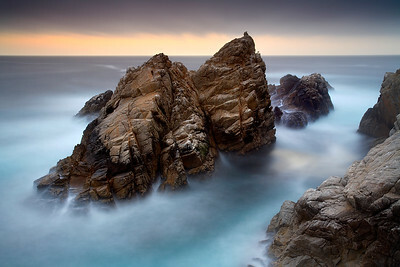 This long exposure of this rock at the western edge of Point Lobos, California allows the structure of the rock to be isolated with no distractions from the ocean. It was made just after the sun set. I'm glad that the seagull on the right side of the tallest point stayed still for most of the 2 minutes! 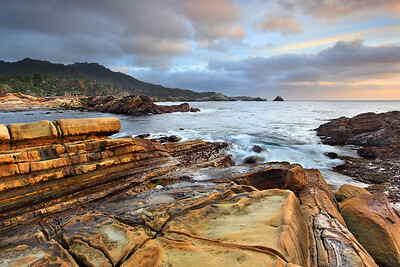 Point Lobos, at the north end of Big Sur just south of Carmel, California could keep a photographer busy for months or even years. 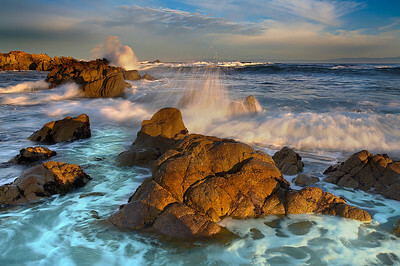 It is a peninsula that has been sculptured by large Pacific waves over millions of years and the results are stunning. This is one of the western-most points of rock and is probably 50 feet tall at high tide. Sometimes waves wash over the entire rock. The most interesting motion was occurring just as the waves curl around the rock. I painted long lines (but not too long) with a 0.6 second exposure. The last light of the day shines up under high clouds on a warm December evening. The pure granite sand on the beach at Carmel by the Sea is like powdered sugar and is so clean that you do not have to wash your feet after you walk the beach. This could be the finest beach in California!